Thanks to a new reference standard developed by the National Institute of Standards and Technology (NIST), law enforcement agencies will have an easier time linking the nearly 200,000 cartridge cases recovered annually at U.S. crime scenes to specific firearms. A new reference standard developed by NIST will help law enforcement agencies link the nearly 200,000 cartridge cases recovered annually at U.S. crime scenes to specific firearms. For forensic examiners to reliably match recovered cartridge cases with ones whose signatures have been recorded in the NIBIN, they need to have confidence in the accuracy of the equipment and procedures used to make the link. That's where NIST's new "standard casing" comes in. The standard contains two items: an exact replica of a master cartridge case with distinct signature marks (obtained from the Department of Justice's Bureau of Alcohol, Tobacco, Firearms and Explosives, or ATF), and a "golden" digital image of those same signatures that reside on the NIBIN. This cartridge case shows the three distinct marks, or 'signatures,' impressed on its surface when it was fired by a gun: the firing pin impression (FP), the breech face impression (BF) and the ejector mark (EM). NIST's standard casing ensures that forensic labs can accurately match signatures on shells found at crime scenes with images in a national database. 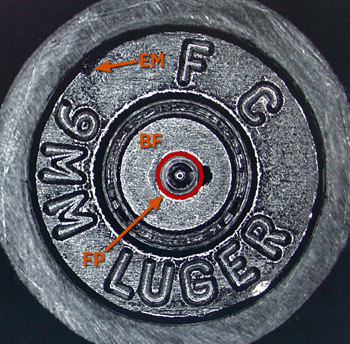 Forensic labs can image the signatures on the SRM cartridge cases—a test of their optical microscope and measurement procedures—and compare those images to the golden image provided by ATF. In this way, lab technicians can verify their equipment is calibrated and functioning properly, validate their methodology, and can demonstrate that their work is traceable to an authoritative national standard. To make the standard cartridge cases, NIST engineers used a technique called electroforming, which is similar to the electroplating method used by jewelers to coat objects with silver, gold and other metals. First, a master fired cartridge case was selected. Then the electroforming process created a near-perfect inverse copy, like a photographic negative, of the master. The negative was then used as a mold from which multiple replicas were made. "The electroforming process is so accurate that the replica cartridge cases made using it have signature marks that are less than a few micrometers—millionths of a meter—different from those on the master," says NIST mechanical engineer Alan Zheng, one of the team members who developed the reference casing. "Together, the two SRMs make a powerful tool for forensic labs and the law enforcers they support," says NIST physical science technician Brian Renegar, another member of the ballistics SRM development team. "For instance, if a crime is committed in California, and another in New York using the same firearm, the link between the two crimes might be missed. The NIBIN network enables forensic examiners to identify these potential matches, or 'hits', where they might otherwise go unnoticed. And the NIST ballistic SRMs ensure that the imaging systems used in the labs are calibrated and operating properly, and that proper measurement procedures are being followed." For more information, including ordering instructions, for SRM 2460 and 2461. * See the Jan. 19, 2007, NIST Tech Beat article, "NIST 'Standard Bullet' Fights Gang Violence."